Song Sparrow with caterpillar (lunch!) surrounded by ripening fruit in a Black Cherry (Prunus serotina) tree. For the new year and beyond, I pledge to do all I can to help achieve a healthy, diverse world, including reducing fossil fuel usage, and using more plants that are native to the area where I live. 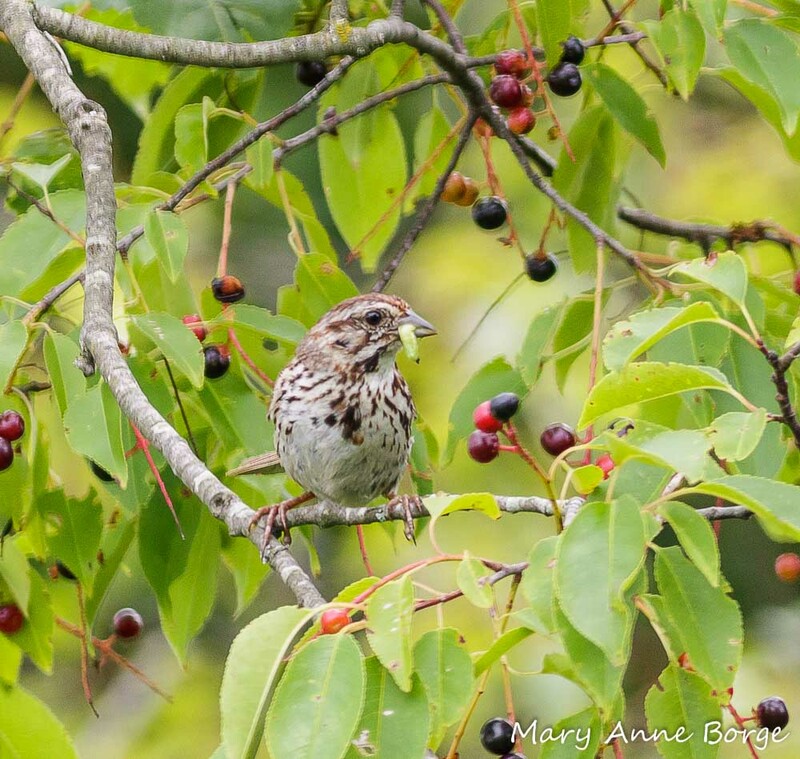 This entry was posted in Birds, Gardening for Wildlife, Nature and tagged Black Cherry, Climate Change, mitigating climate change, Prunus serotina, Song Sparrow by Mary Anne Borge. Bookmark the permalink. I am in! And I will spread the word via French and Pickering Creeks Conservation Trust Facebook page and website, where I share all of your blog posts. In the beginning of the year, I do a series of New Year’s Resolutions for the Planet. If you have any I might not have thought of, please let me know! Last year, I was only planning on doing one for each day in January, but it ended up extending into March. This year, we are thinking of making a book/booklet of the resolutions. They are mostly targeted to our watersheds, in the Phoenixville area, with lots of local tips. My brain challenge this year will be also making them more universal. For instance, I do a post about each local nursery that sells native plants. So I will have to include a national directory of nurseries, probably through wildflower.org. As summer approaches, I do a series of fun, environmentally friendly daytrips, and of course, Bowman’s Hill is one! Really Amazing !!! i would like to add to my bookmark. you surprise me. thank you for sharing !! If we all do a little, together we make a difference. Thanks for sharing the pledge. Pass it on! The more of us, the better! I really hope so! Pass it on! I am definitely on board! Each year, I am adding more native plants to my landscape and garden, and I start seeing more insects and songbirds as visitors. Such a pleasure. Also, I just finished reading “Climate Justice” by Mary Robinson (2018) and feeling re-inspired to do whatever else I can…. I believe that we can all make a difference, that what we do matters. Connection with what truly matters cheers me up. You cheer me up, MaryAnn. The world of man seems to be lurching around but the sun rises, the clouds drift and the plant world adapts. My recent favorite sight was the weeds in the cracks of the artificial turf at the high school. I know what you mean! I grew up on the south side of Chicago and as I took the train downtown I saw trees sprouting up in abandoned parking lots. There’s a building lot on a steep slope near where I live where trees were cut to put in a foundation for a duplex. The property hasn’t sold, and trees are growing again in the foundations. I love that. We humans may do ourselves in, and if we do we’ll take other species with us, but eventually, nature, of which we are a part and yet have a hard time seeing it, will reclaim its own. Thank you, Simone! Best wishes to you for 2019 and beyond. You’re starting a movement, Mary Anne! Let’s all share this pledge with audiences far and wide. There’s just too much at stake not to. Thanks for spreading the word, Julie. It really matters! Count me in!!! Thank you for sharing your knowledge. Thanks, Carolyn! Spread the word! Thanks, Patricia! Help spread the word! Thank you, Jean! Spread the word! I’m in! More native plants for the meadow! I’m with you, Mary Anne! Thank you for showing me why it’s important and how I can do it! Hear hear! I am with you all the way! Thanks, Juanita! Happy New Year to you, too!